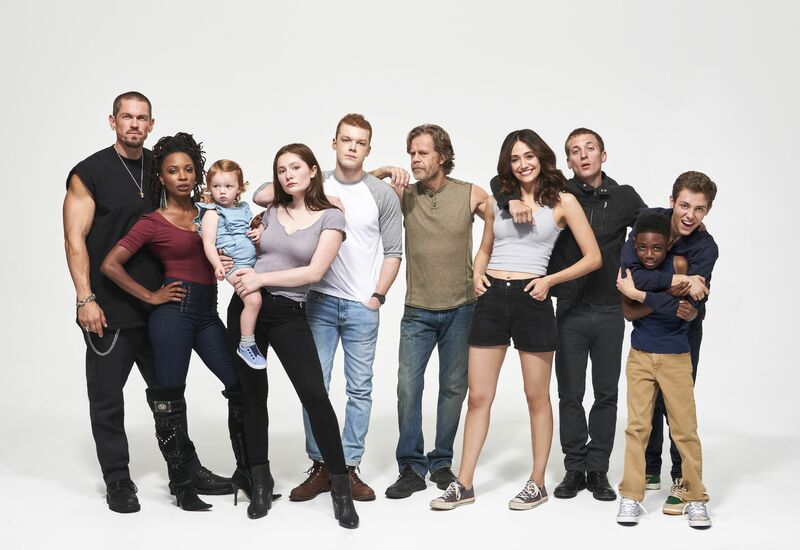 LOS ANGELES – August 6, 2018 – SHOWTIME has announced that the ninth season of its hit comedy series SHAMELESS will expand to a 14-episode order, and will air in two parts – this fall and in winter 2019. The first seven episodes will begin airing on Sunday, September 9 at 9 p.m. ET/PT, with a midseason finale on Sunday, October 21 at 9 p.m. ET/PT. The second half of season nine will premiere on Sunday, January 20, 2019 at 9 p.m. ET/PT. Starring Oscar® nominee and Emmy® and SAG Award winner William H. Macy and Golden Globe® nominee Emmy Rossum, SHAMELESS is one of the network’s longest-running and most successful series, and ranks as the network’s No. 1 show, attracting the youngest-skewing audience of any SHOWTIME series. SHAMELESS season nine will feature the show’s 100th episode in week four, and is currently in production in Los Angeles. In season nine of SHAMELESS, political fervor hits the South Side, and the Gallaghers take justice into their own hands. Frank (Macy) sees financial opportunity in campaigning and decides to give voice to the underrepresented South Side working man. Fiona (Rossum) tries to build on her success with her apartment building and takes an expensive gamble hoping to catapult herself into the upper echelon. Lip (Jeremy Allen White) distracts himself from the challenges of sobriety by taking in Eddie’s niece, Xan (Amirah Johnson). Ian (Cameron Monaghan) faces the consequences of his crimes as the Gay Jesus movement takes a destructive turn. Debbie (Emma Kenney) fights for equal pay and combats harassment; and her efforts lead her to an unexpected realization. Carl (Ethan Cutkosky) sets his sights on West Point and prepares himself for cadet life. Liam (Christian Isaiah) must develop a new skillset to survive outside of his cushy private school walls. SHAMELESS also stars Jeremy Allen White, Ethan Cutkosky, Shanola Hampton, Steve Howey, Emma Kenney, Cameron Monaghan, Richard Flood and Christian Isaiah. Created by Paul Abbott, SHAMELESS is produced by Bonanza Productions in association with John Wells Productions and Warner Bros. Television. Developed for American television by John Wells, the series is executive produced by Wells and Nancy M. Pimental. SHOWTIME is currently available to subscribers via cable, DBS and telco providers, and as a stand-alone streaming service through Amazon, Apple®, Google, LG Smart TVs, Oculus Go, Roku®, Samsung and Xbox One. Consumers can also subscribe to SHOWTIME via Amazon’s Prime Video Channels, DirecTV Now, FuboTV, Hulu, Sling TV, Sony PlayStation™ Vue, and YouTube TV. The network’s authentication service, Showtime Anytime, is available at no additional cost to SHOWTIME customers who subscribe to the network through participating providers. For more information, go to www.SHO.com.